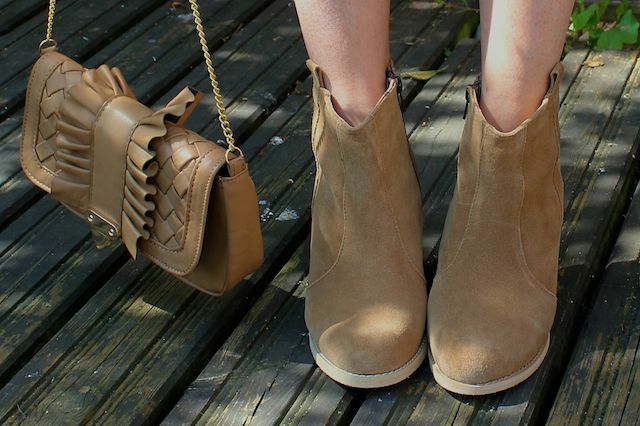 buynow/bloglater: I dedicate this post to my new boots. I dedicate this post to my new boots. Lets not beat around the bush here. This post is an excuse to show off my new boots. They are from ASOS. They were £45 and I got them on Saturday. Note that they are likely to be welded to my feet going forward. Cool, comfortable and Isabel Marant inspired for a 10th of the price? Yes please! They look good with silly little dresses and skinny jeans. I can't wait to pair them with shorts, with skirts....well with bleedin' everything! Good in summer and good in winter - you really CANNOT go wrong. I wore them with an aforementioned silly little dress yesterday...it felt like a nice balance. A little bit feminine and a little bit tough - but not too much of either which makes me feel comfortable. 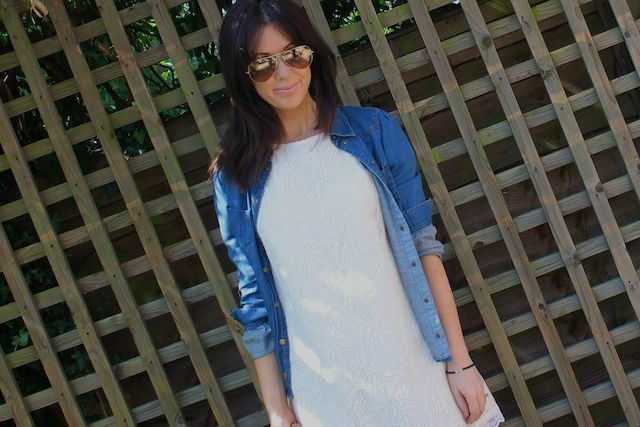 * The lacy white dress - love this kind of high neck, shift mini. Modern and retro all-in-one. * The denim shirt - like the boots, adds a little edge and whilst it's a little dull and generic now, it felt good and so that was enough for me. Jewels: Sideways cross necklace (hurrah! It returns! Link to etsy seller! ), black beaded bracelet from Tiffany & Co (JENNIFER: I got your email and thats where I got it from: never take it off :) and usual watch from Michael Kors. If anything I urge you to get the boots. They are so versatile and very easy to walk in. My only bit of advice would be to think about sizing. I got a size 5 and part of me thinks I could have done with a half size smaller - if they even did half sizes. If you are between one size of the other maybe go for the lower number but then they are pull-on...oh I don't know, it was just a thought! Love those boots. They can be for a dressy look or a more casual one. Love em! I love the boots but is that a beautiful engagement ring I spy or am I way behind in the times? So i've been completely torn, but they do look good on you. @Crystal - love em too :) such a good buy! love how you paired the dress with the boots! perfection! What is the sole like? you look gorgeous. i love footwear like this that matches with everything! I love it, you look like a cute frilly cowgirl. I wish we had a Topshop in LA. @plastic_fashion - thank you :) love em! @Holly - thank you so much Holly! @D - haha thank you! Topshop is hit and miss sometimes....their WInter stuff looks AMAZING though! @Charlotte's Obsessions - haha sorry :) and yes i too have the fear of white but its such a great colour to wear! Gotta take the risk. I LOVE the shoes with that shape of dress! now im off to asos to see if theyre available in black or grey even though the colour youv got looks best, theyd be so dirty on my feet withn minutes. how's the heel height? ive been contemplating on those but i ended up buying the Aldo Qualheim which is about $15 more only but look much similar to isabel marant dicker/forbes. Geez, you'd think they'd have a gazillion IM Dicker knockoffs 'cause it's so famous, but it's so hard to find without paying TOO MUCH!!! Love the boots and the dress! 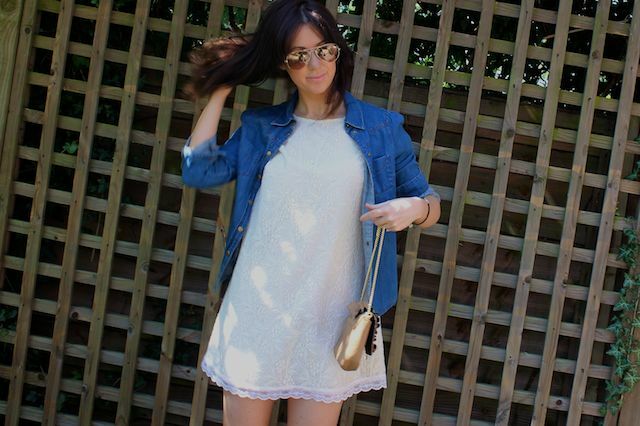 Aren't lace dresses the best? And of course love ASOS. Love this outfit from head to toe!! I got some "cowboy mini boots" back in december and LOOOVE them. Side note: I may be a little late mentioning this but do I spy something "extra" sparkly on your ring finger? :) Did you get married during your YT break? If so, congrats! The Rayban's look great on you. Very nice post !! I love all of these pieces!!! the dress suits you so well. the denim jacket instantly made the look more casual. the boots- so beautiful and they'll be so great for the fall. thanks for providing the link... I want to buy but I shouldn't ahh what a dilemma haha. big bag means more crap is so true, im a "stuffer," I can stuff and stuff everything and anything that I do and don't need into my satchel. The boots look great and I really like how you have teamed them up with the dress. It looks great. I nominated you in the Cosmopolitan awards - new fashion blog category. 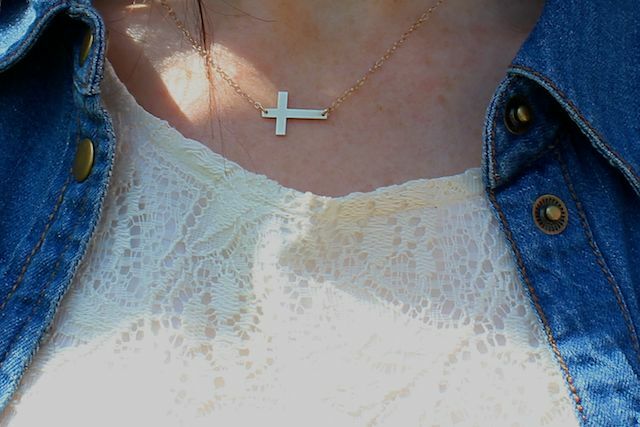 Great dress and cross necklace!I just posted about lace today! I love those boots, spotted a similar pair on Style of a Fashionista who seems to wear them a lot. I've got a similiar pair in black but really want the tan. I was secretly wishing you wouldn't have these only because everyone else will now! We are such a fickle lot! I am really late on seeing you came back to the blogging world. But I am thrilled. I've always loved reading your blog, especially the clothing and fashion bits. Glad to see this blog will be more centered around that. I always admired your taste in clothing..nice to see you're back! love them especially the colour! I almost bought these Asos boots, but like Angel, bought the Aldo Qualheim boots instead since I was exchanging some wedges. Just got them today, and they're super comfortable, but come with distressed areas that I was not expecting. Love your Topshop bag, too! Enjoy your new boots!